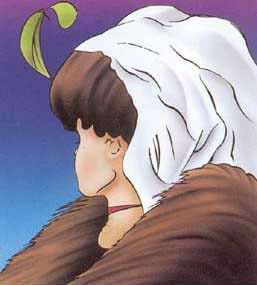 2 Corinthians 5:6-17; and Mark 4:26-34.
a young lady or an old woman? We live in a world that mostly believes what you see is what you get. We trust our eyes to reveal what is real and what is true. For most of us, I suspect, this is our default attitude and orientation to other people, our relationships, and the circumstances of our lives. This approach certainly has its benefits. It is easier, definitive, and more efficient. It is not, however, without problems. A what-you-see-is-what-you-get attitude assumes that life is limited to physical and tangible realities. It keeps us skimming across the surface of life. It puts humanity at the center of life as the final interpreter and arbiter. We tend to see what we want to see, what we have been taught or told to see, and what we expect to see. Just because we look at the same thing doesn’t necessarily mean we see the same thing. Three eye witnesses to an accident will most often tell three different stories of what they saw. I remember taking my younger son to the bird park one afternoon when he was four or five years old. We walked the trails, talked, laughed, and played. Walking back to the truck he said, “Do you see that bird on the pole?” “Yes,” I said. “He is red and very noisy.” To me it looked just like any other redbird, but not to Randy. “He’s talking to me,” he said. “He doesn’t want me to leave. He wants me to stay here with you.” He saw much more than a noisy redbird. He saw a relationship, love, security, and contentment. He was willing to see in a different way. What we see is determined not so much by the thing seen but by how we see. I am convinced that a primary purpose of holy scripture and sacred doctrine is not just to tell us what to see but to teach us how to see. Paul reminds the Corinthians that “we walk by faith, not by sight” (2 Cor. 5:7). Samuel looked on Eliab and thought he was the Lord’s anointed, the next king after Saul. “But the Lord said to Samuel, ‘Do not look on his appearance or on the height of his stature, because I have rejected him; for the Lord does not see as mortals see; they look on the outward appearance, but the Lord looks on the heart’” (1 Sam. 16:6-7). Too often human-seeing is outwardly focused and appearance based. God-seeing, however, is inwardly focused and heart based. This is not a rejection of outward and visible appearances but the recognition that our life and world is not limited to what we see. For every outward appearance we see there is a deeper inner reality. A what-you-see-is-what-you-get way of living is too limited, narrow, and small. It cannot reveal the fullness of God’s life and presence among us. It offers no hope for reconciliation, forgiveness, healing, and transformation. It says to us, “This is as good as it gets.” If that’s how we see our life and the world then we might need to learn to see differently. God-seeing reveals that in Christ there is a new creation, everything old has passed away, everything has become new (2 Cor. 5:17). We are always being invited into a deeper seeing. That’s what Jesus’ parables are about. They are the lens that aligns human-seeing with God-seeing. They give us a glimpse into God’s kingdom even as we look at the things of this world. Parables ask us to see in a different way. They rarely give answers. Instead they sharpen our focus and cultivate a deeper vision. Parables ask us to let go of a what-you-see-is-what-you-get world and trust that what we see is not all there is. There is always something more going on than what we see. That something more is the kingdom of God. The kingdom of God is already planted in creation. God is always at work in our lives like a seed scattered upon the earth. As a seed does its seed thing so the kingdom does its kingdom thing. We may not understand it. Outward appearances may even suggest God is absent. It may look like nothing is happening. We sleep and rise. We wait. We trust. We hope. We pray. We go about the ordinary work of life. Within that ordinariness the life of God has already been planted in each one of us. One day it sprouts. It grows. The invisible becomes visible. The full harvest was always there hidden in the seeds. It may have been invisible but it was never absent. We now see what has always been. Compared to the needs of the world and the circumstances of our lives the kingdom can often look small, insignificant, and inadequate; like a mustard seed. Looks, however, can be deceiving. It is only an optical illusion. The kingdom will take over. In first century Palestine mustard was considered a weed. Jesus compares the kingdom with a weed. As weeds take over, so does the kingdom of God. You can refuse to plant it. You can pull it up. You can cut it down. Regardless, it is there and it keeps coming back. No person or circumstance is ever Godforsaken. The redbirds, seeds, and weeds of life are everywhere. Don’t just look at what you see. Look at what is there. Look again if you need to. Look more deeply. Change how you see. Behind every redbird, seed, and weed is the faithfulness, promise, and power of God to change lives.